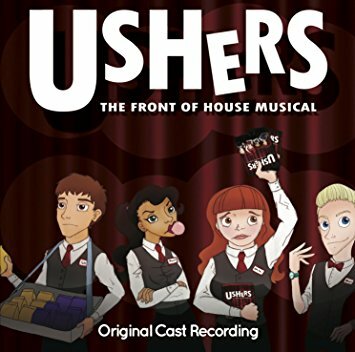 The cast recording for USHERS: The Front Of House Musical was released in advance of its 2014 run at the Charing Cross Theatre but ever the trail-blazer ;-), I saw the show a few months before when it played at the then newly inaugurated Hope Theatre. There, its homespun charms won me over, with its tales of drama in the theatre but not the onstage kind, rather it is the Front of House staff in the spotlight here. Written by Yiannis Koutsakos, James Oban and James Rottger, and simply orchestrated for Lee Freeman on the piano, it is a short and sweet cast recording but one which wisely makes a virtue of it. These aren't particularly epic songs or grand stories but intimate pieces and personal tales of love and betrayal, audience members and interval ice-creams, and so they suit the smaller focus that they're given here. Whether Daniel Buckley's bittersweet 'Half-Finished Story', Carly Thom's wistful 'Dreams and Ice-creams' or Ralph Bogard's forthright 'Spend Per Head', the melodic power of Koutsakos' score is undeniable and the storytelling clarity of the lyrics makes each song impactful too, as well as hilariously recognisable in working through the various ways in which theatre audiences are awful. Throw in some lovely harmonising across the whole record and it all sounds highly entertaining. I'm definitely ready for a revival of this sometime soon.